The All India Kisan Sabha claimed the Maharashtra government led by Devendra Fadnavis has not fulfilled its promises to farmers after the protest march in March 2018. The farmer's demands include immediate relief in view of the drought-like situation, land rights, minimum support price for crops, better water resources, and a crop insurance scheme. "A year has passed, but the state government is yet to fulfill its promises," said Maharashtra General Secretary of Kisan Sabha, Ajit Navale. "Hence, the long march is being organized to protest the betrayal of farmers by the BJP-led state and central governments." Farmers from 23 districts across Maharashtra joined the march, which was flagged off from Nashik on Wednesday to mark the fourth death anniversary of Communist ideologue Govind Pansare. The farmers aim to arrive in Mumbai on February 27, when the state Assembly's Budget session will be underway. Police estimated at least 7,500 farmers had gathered in Nashik. 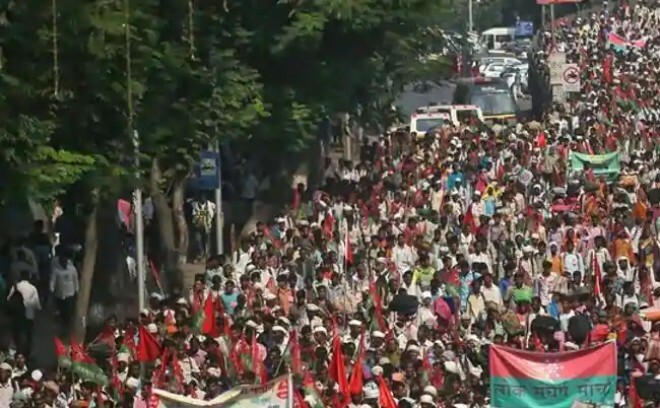 Organizers of the protest march alleged that the state government was trying to "crush" the peaceful march through force. "For several hours, police kept detaining groups of farmers coming to join the procession without assigning any reason," said Kisan Sabha spokesperson PS Prasad. "Cases are being lodged against our office-bearers."